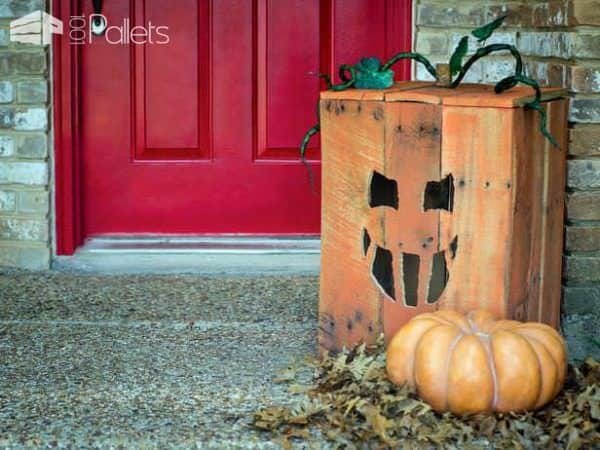 75+ Fabulous Pallet Halloween Ideas: Are You Ready to Pallet-ify Halloween? 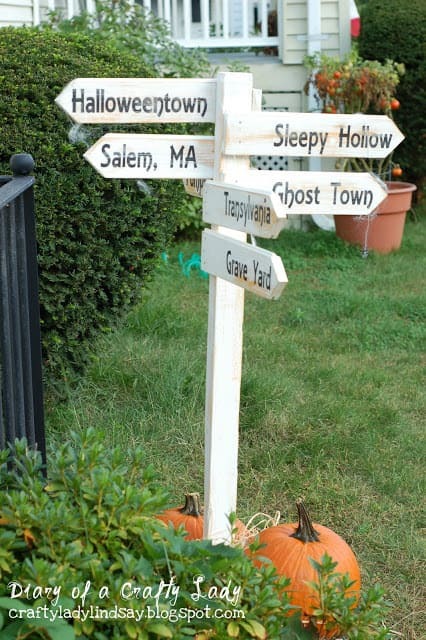 Here are 75 & more pallet Halloween ideas that are FRIGHTFULLY fabulous! They range from super-simple to HAUNTINGLY intricate. Thanks to our past crafters for some of these submissions, and to the DIY community in general for other ideas! We can't wait for more! Put those scrap blocks to good use. Some of these ideas would require NO woodworking experience whatsoever, and you don't have even to be good at art. You just have to have a little fun (and a few leftover/scrap nails). 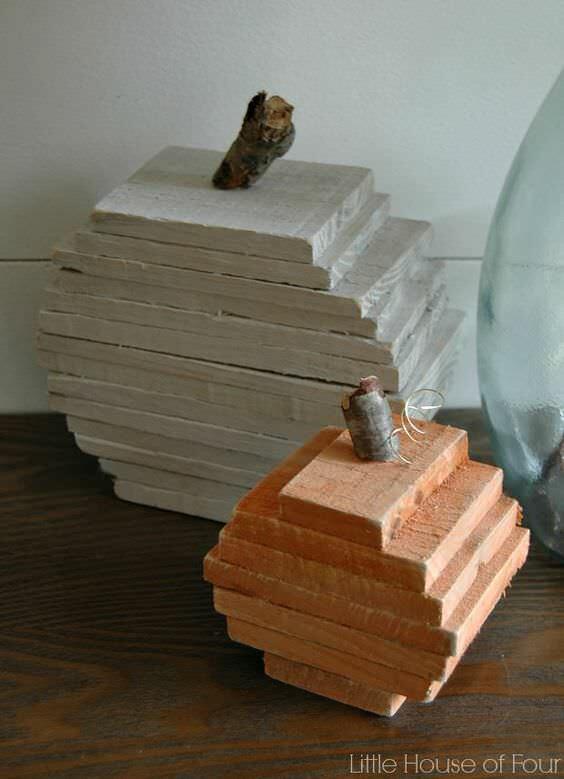 These would be great for centerpieces, for placeholders - like making a different block creature for each of your family or friends - or just decorative touches. Use those scraps and trimmings you have lying around in a bucket or container.  If you save a lot of scraps, you may not even have to do much cutting at all. Add a piece of branch for a stem, and coat the boards however you want, and you've got master-"pieces." These pumpkins wouldn't rot or freeze and don't have to be carved. 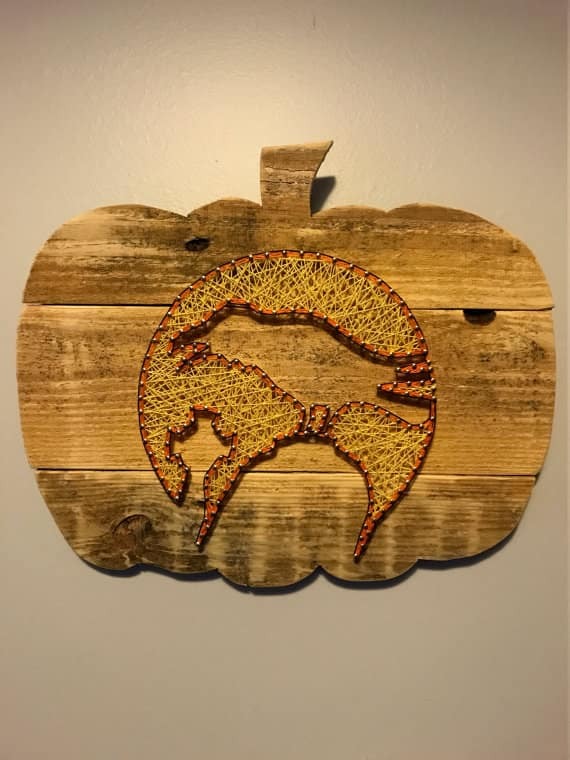 A "Pumpkin" Lantern decoration made from pallet wood. 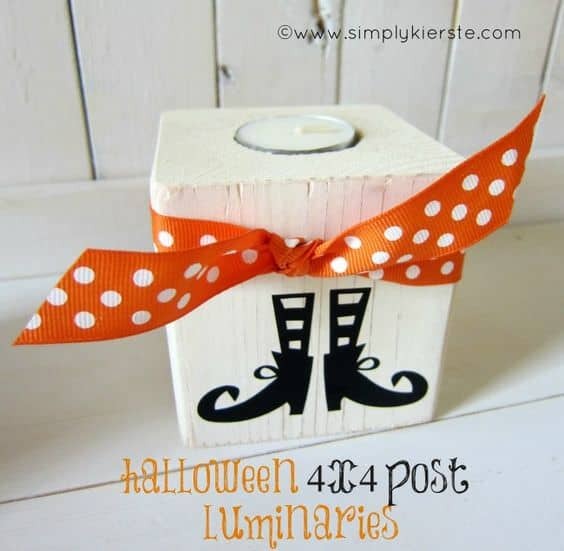 This charming lantern can be made with an adorable face or as frightening as you want it! Painting the carved-out areas highlights the workmanship. For safety, light it up at night with glow sticks or little LED candle lights. When crafting with pallets, we all end up with one or two boards that are partially split or broken on one end. Wouldn't they be terrific for these little cutouts? 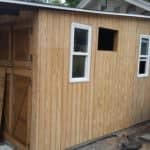 You could accomplish these with just a hand saw if you want, but a jig saw or band saw would make the project even faster. 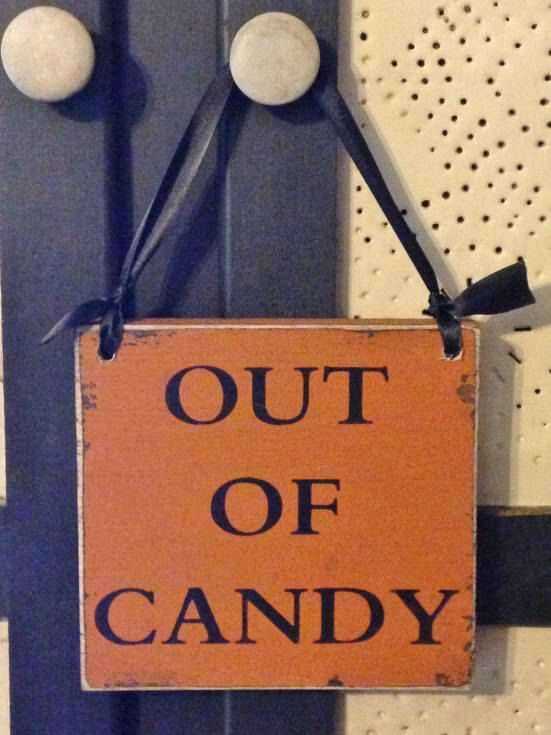 Another brilliant and fun idea: make an "out of candy" or "out of treats" sign for your front porch if you don't want to turn out the porch lights. Again, you wouldn't have to do a single cut. 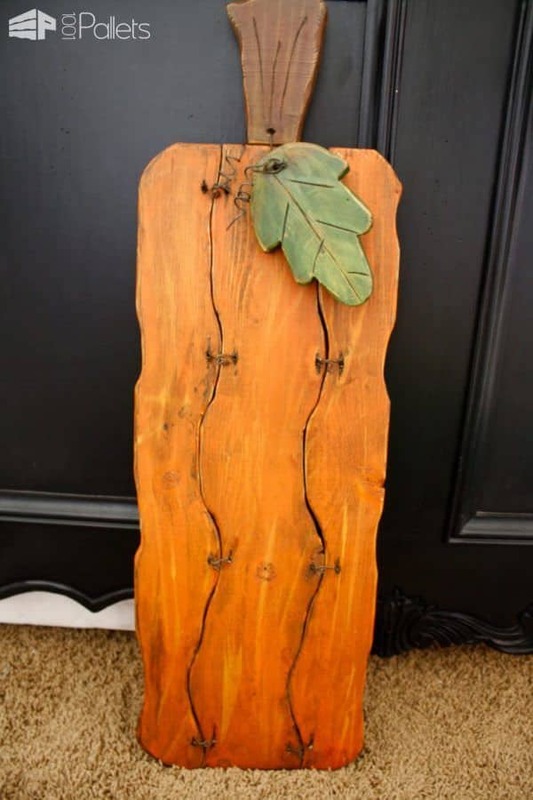 Use a scrap piece of wood and decorate it as you choose. How about this scrappy little creature? 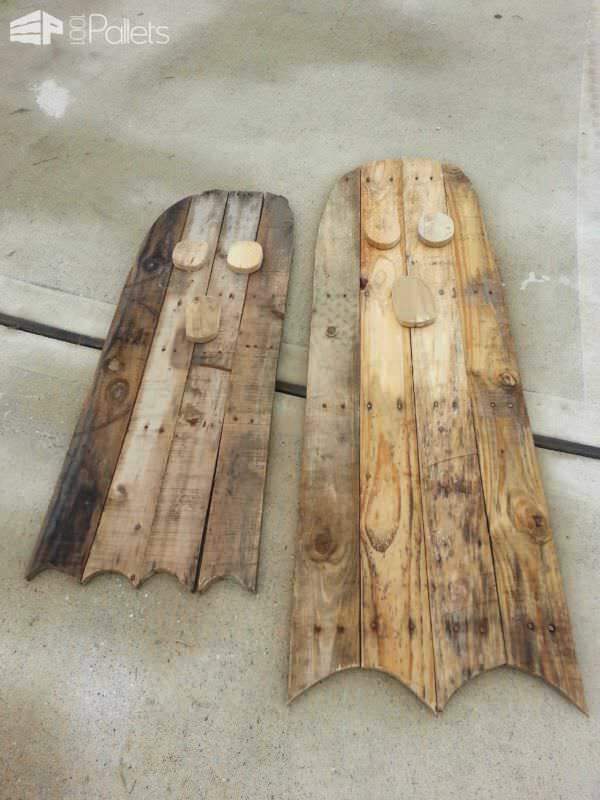 These could be made from bits and pieces, and they'd be amazing for your Halloween decor. 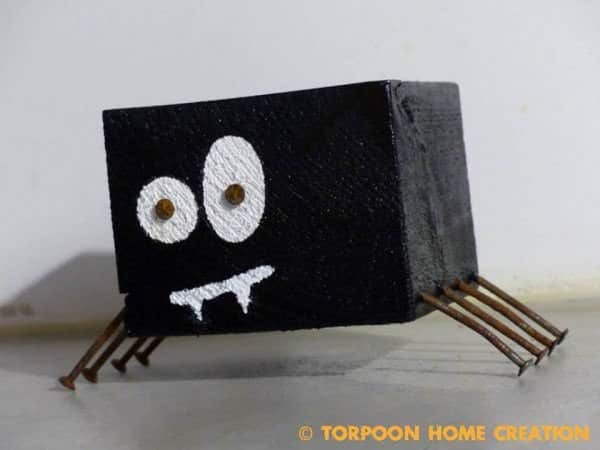 You can make crazy spiders, or scary ones with fangs, or anything else your Blackened, Halloween Heart wants. Block Candle Holders are great and can be drilled out or just chiseled out for shallow tea lights. Then, just decorate them any way you want! 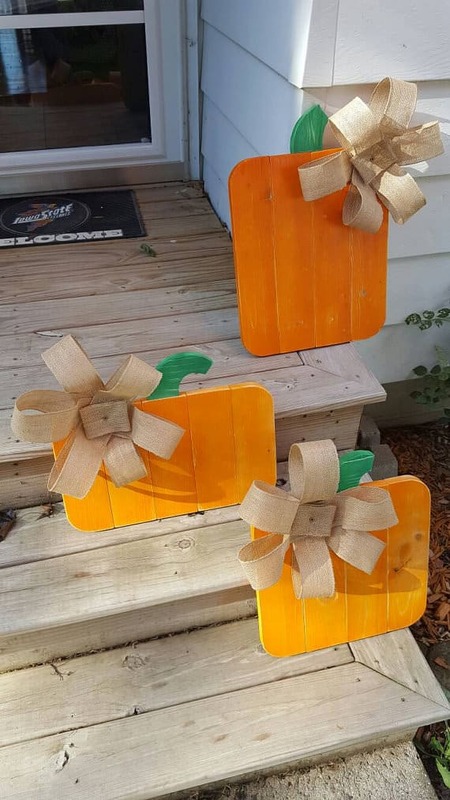 These simple pallet block pumpkins can be used for Halloween and all the way through Thanksgiving or the full fall season. Create your own colorful or whimsical style, and change it up whenever you want! These would be a great project to do with the kids! 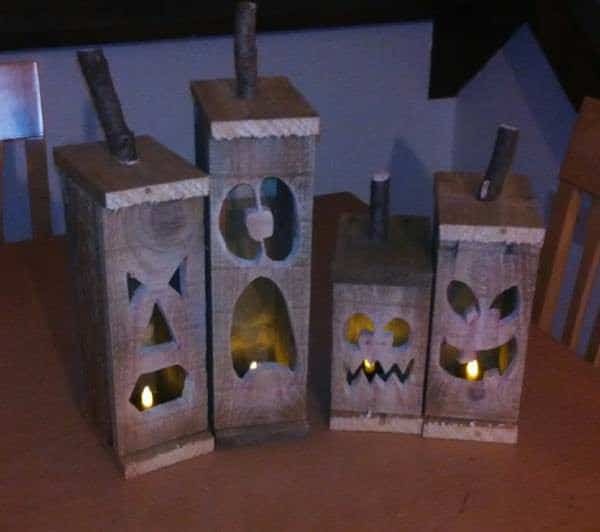 Another style of pieced-together Block Pallet Pumpkins. Make this project and use it all the way through the fall holidays! 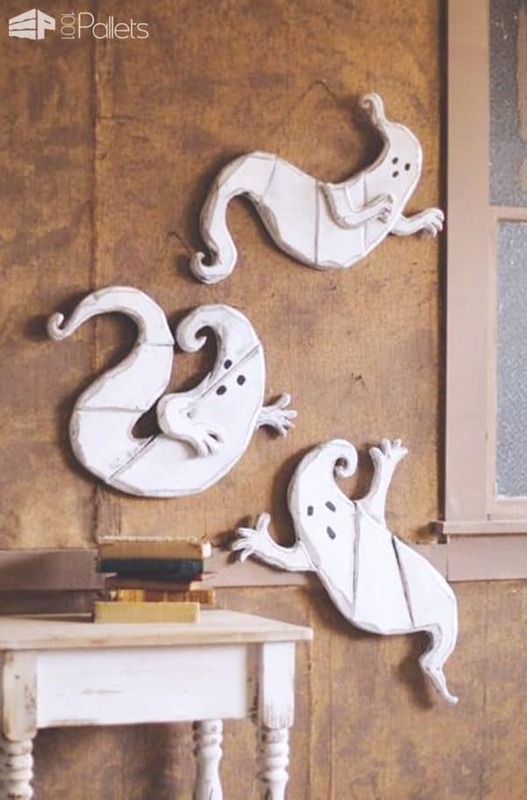 These little ghosts could be pieced together from scraps in your workshop (or cut out from broken boards or scraps), but no one would ever know! Use some scrap wire to hang them (or a stronger fishing line), and get "spirited". 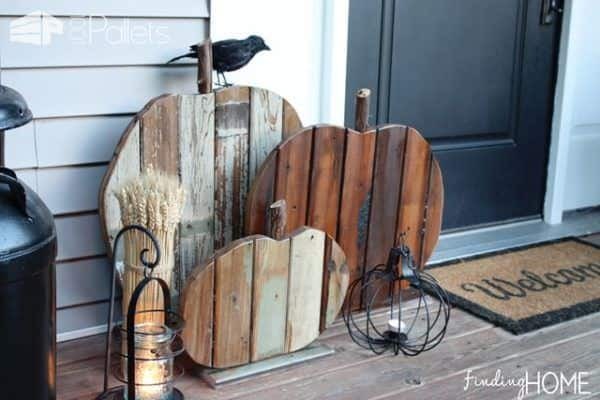 This pieced-together pumpkin would be ideal for that one pallet board that got split or damaged. You NEED to have a cut board, so why not let Mother Nature (or wrong forklift driving) help you along with it? Then, lace the parts together with twine, wire, or anything else you choose. This witch COULD cost you five dollars... Or you could use your Pallet creativity, and do it for FREE! Wouldn't this be fun to prop in a corner, or put outside in front of the shrubs? The next set is a bit more challenging, but worth the extra bit of effort, and would dress up any Halloween decor. This Jack O' Pallet is EXTREMELY challenging. Don't roll your eyes. How can any of you resist all those intact boards? But make this craft, and THEN turn it into something else. That's the beauty of pallets as a medium. 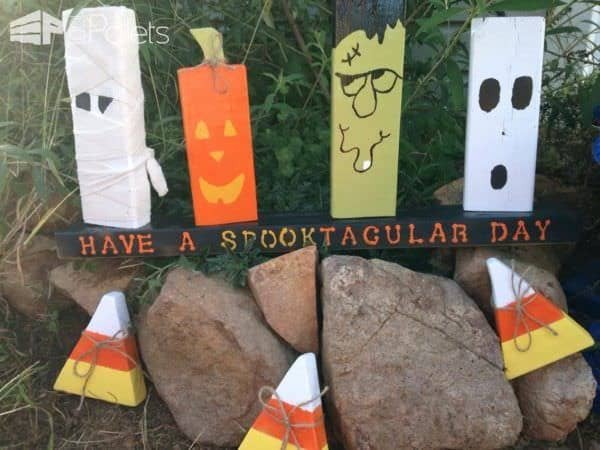 These pallet ghosts aren't scaring anyone, but they're certainly charming. 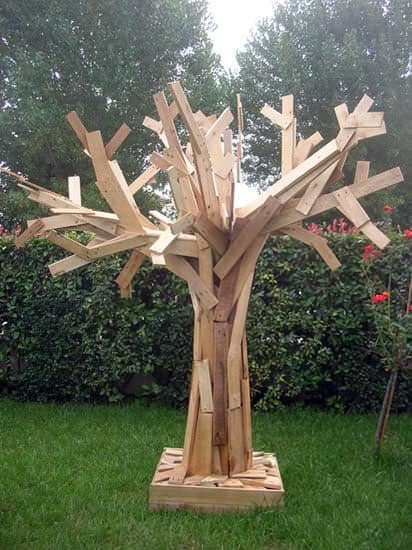 It wouldn't take too much to make these, and again, you could use partial pieces of wood, too. Just adjust your ghosts for the scraps you've got! 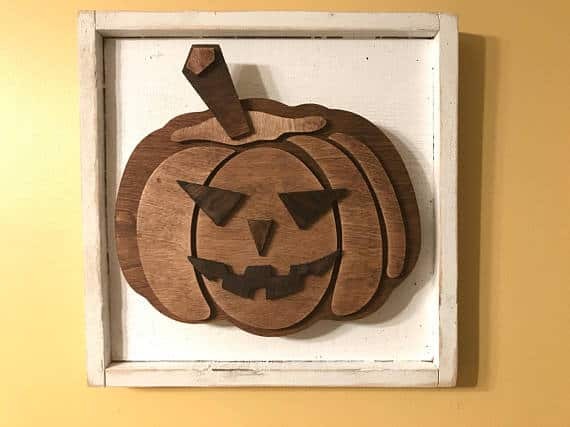 Halloween Pallet Wood Decorations: Jack and the Boos. 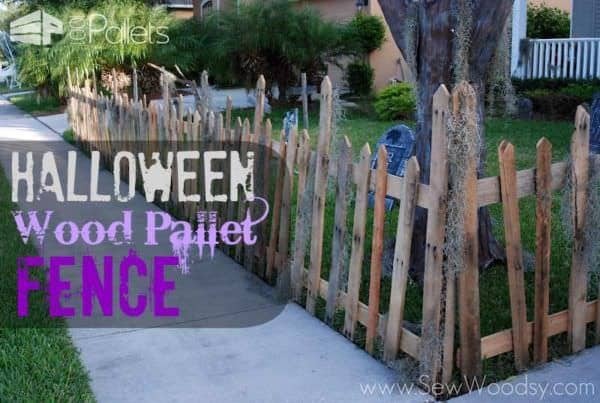 Spooky pallet Halloween fence, the more uneven, the better! 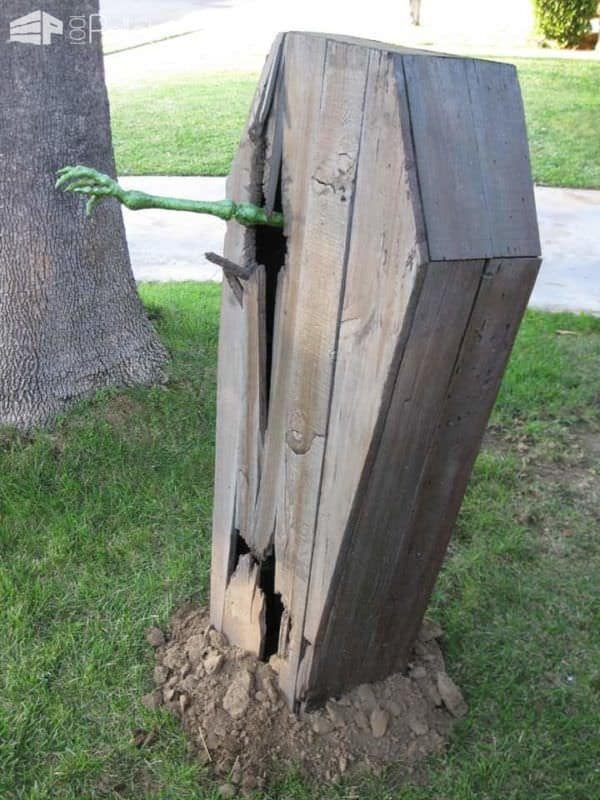 Another frighteningly fabulous coffin made from pallet wood. 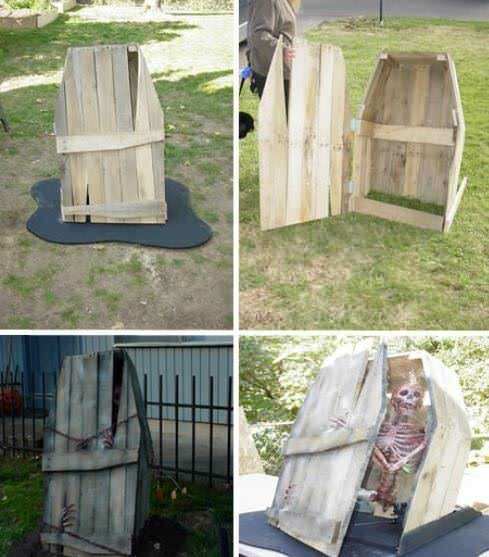 Recycle your wooden pallets and create a super scary Halloween prop, with this wooden coffin idea. 6 x 28 inches of pallets nailed together is the best size for the most realistic coffin. Carefully saw each corner to create the correct shape. Use wooden slats to secure the pallets at the sides and nail in hinges to make the lid swing open. You can display the coffin either empty - or full of sweets, pumpkins or other spooky treats. 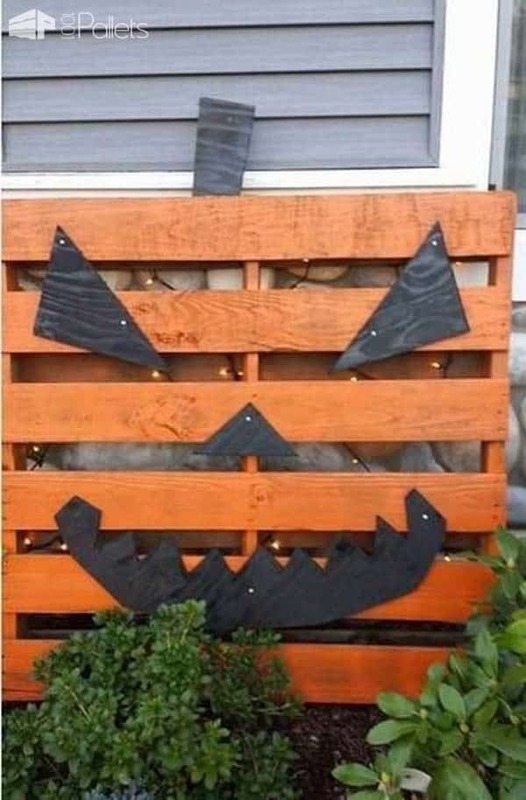 A cool Halloween pallet wood fence again, the more crooked and uneven, the better. It gives the appearance of a rundown, abandoned house! A touch of Halloween elegance! Think of how useful a simple centerpiece box like this one, made from pallets, could be for MANY parties or gatherings! 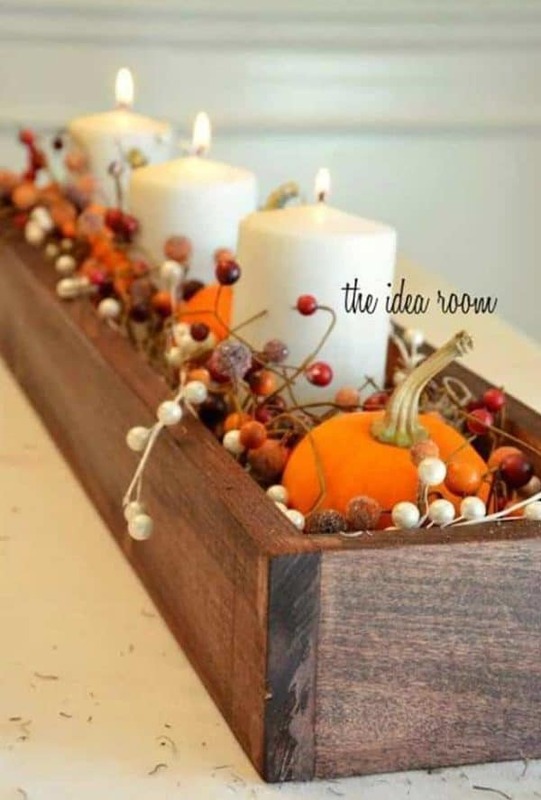 It could become a tradition to pull this centerpiece holder from where it is stored and have the family help to create new ideas for each event. Look at these super-simple Halloween pallet mummies. 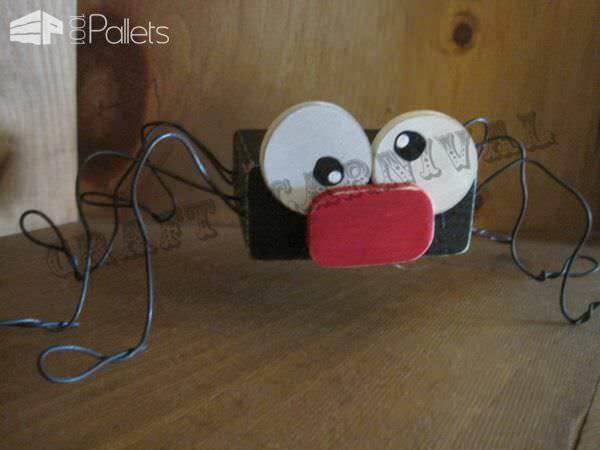 Just wrap some pallet wood pieces in some scrap material or bandaging, and add some eyes. So cute and easy! 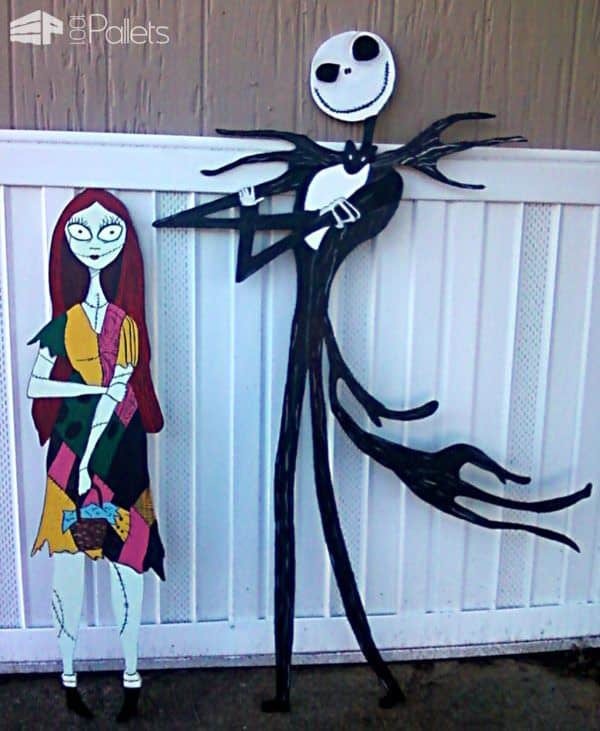 Haunted pallet gate: Halloween ideas inspired by Hotel California, Poe's The Raven, The Walking Dead, and The Treehouse of Horrors. 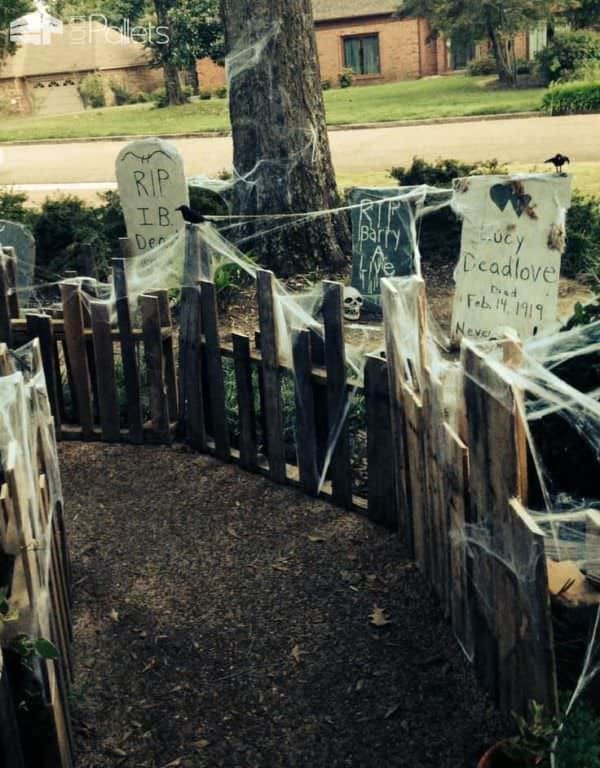 Now, this Halloween spook-fest doesn't even need any building skills or tools! Make it more frightening by having the kiddies make little hand-prints. Add some plastic body parts, easily found at a discount store such as a dollar store, and make it even more creepy! It would be an excellent project to have the kids help out on. "Bloody" little handprints are much more frightening than usual ones. 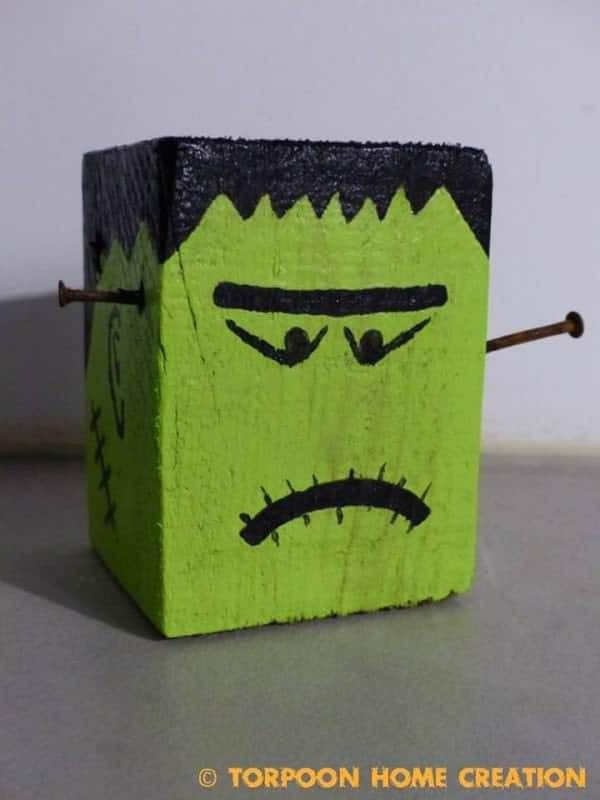 Horrifying Halloween lamp posts made from pallets. 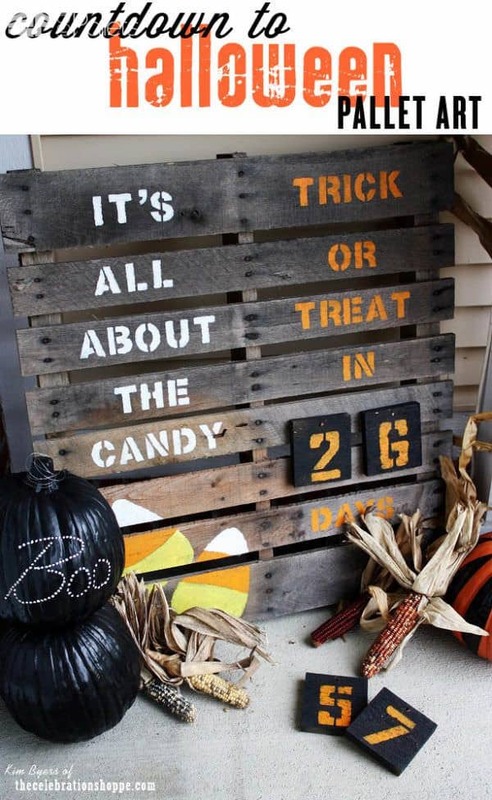 How about this fun countdown to Halloween pallet sign for your porch? You'd just need some stencils to spraypaint, or have fun and hand-paint them. Another project that you could enlist the kids to help with! 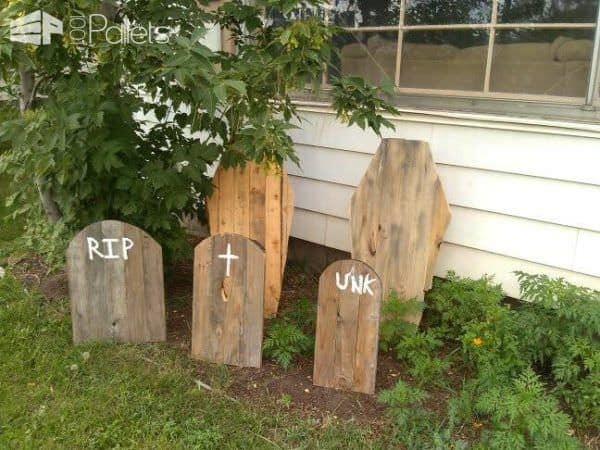 Recycle your wooden pallets by using different pieces to create a gruesome graveyard! Half pallets can be used as gravestones, while two single pieces can be crossed over to create crosses. 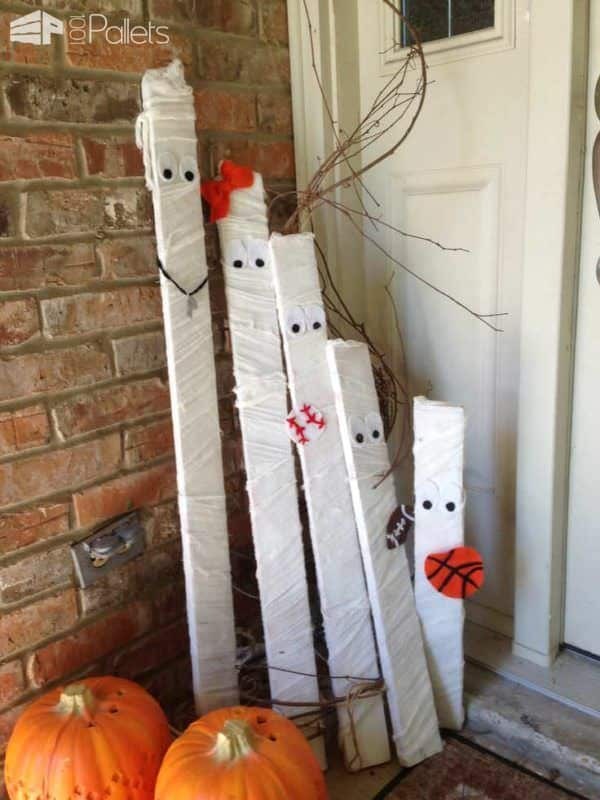 Stick the wood into the ground and drape fairy lights over them to add to a spooky effect. 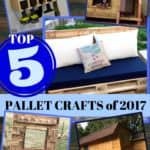 More inspirations for that perfect 1/2 coffin decoration from pallets - you don't have to make a full coffin. 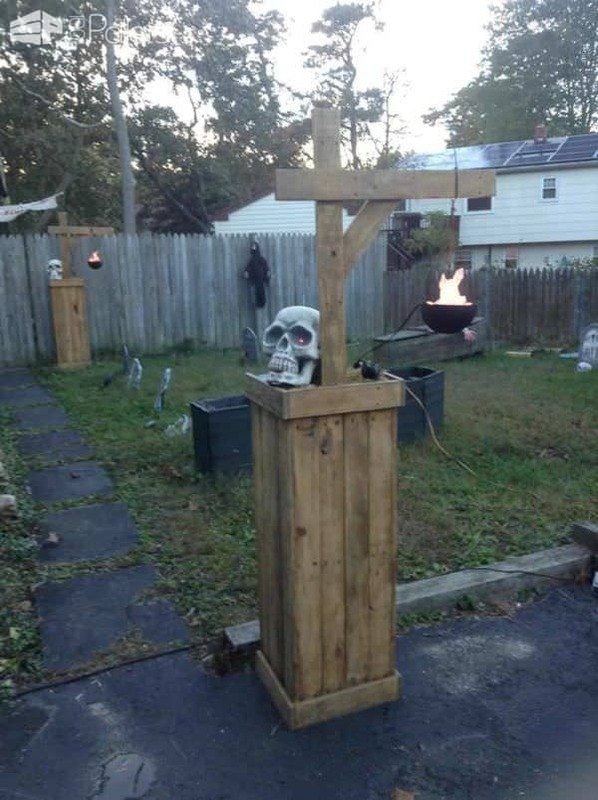 "Cheat", and make a 1/2 one, and put some dirt around it like it's pushing up from the ground, and you save yourself time, wood, and still will have a terrific Halloween Front Yard! 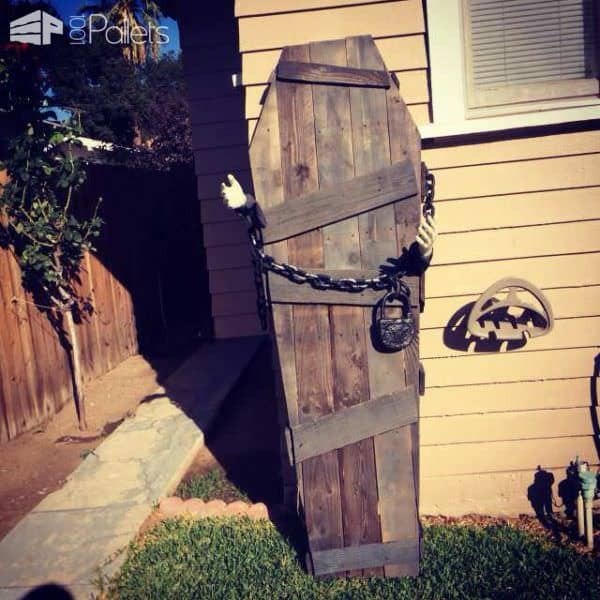 Pallet wood Halloween casket and fun tombstones. Having a Halloween party? 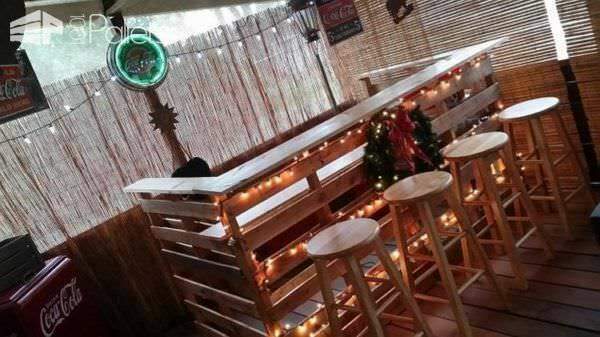 Why not recycle your wooden pallets to create your very own bar. 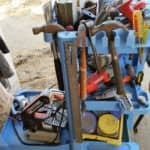 Pile the pallets on top of each other to reach your desired height and nail them together to create a free-standing bar. You can use solid wood on the top to make a flat, wide surface. Cover the bar in pumpkins, candles, and fairy lights before lining up some bar stools along the side. You’ll be ready to serve up your Halloween treats! 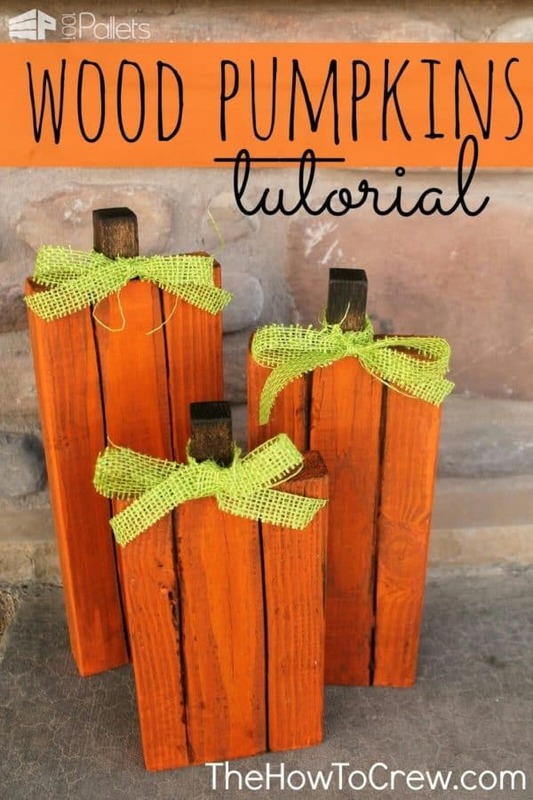 Make your own Pallet Pumpkin Patch! Going to a discount or clearance store for a set of vines or greenery, and have some fun! These pumpkins must've been plucked a while ago. They seem to have lost their foliage ... But would still look outstanding out on your front yard! 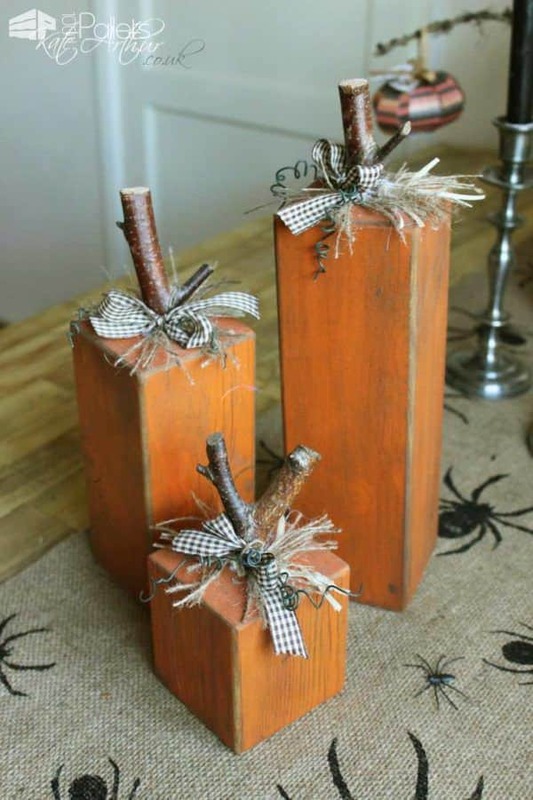 A trio of gorgeous, rustic pallet wood pumpkins. 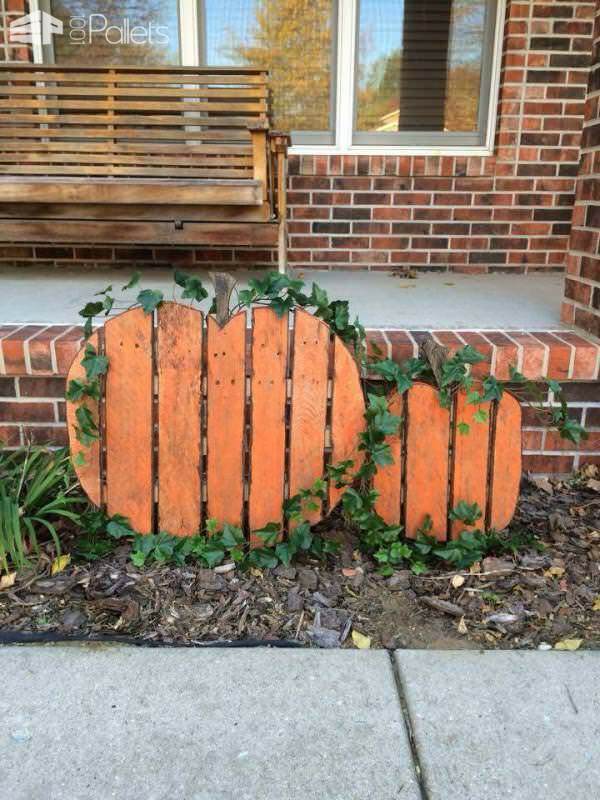 Transform your pallets into pumpkins just in time for Halloween! Paint the wood using orange colored outdoor furniture paint. Get creative and add glitter, or draw on spiders! To make a more realistic pumpkin, either paint on the brown stalk by hand or attach a wooden log to the top of the crate with string. These look great stacked by your front door or propped up on the garden steps. 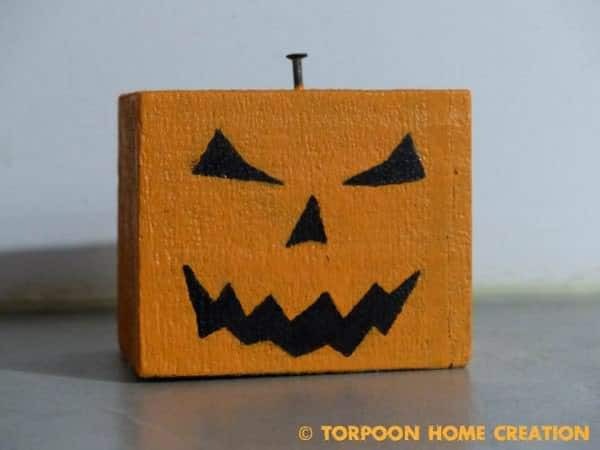 Boxy Halloween Jack-o'-Lantern from pallet wood. 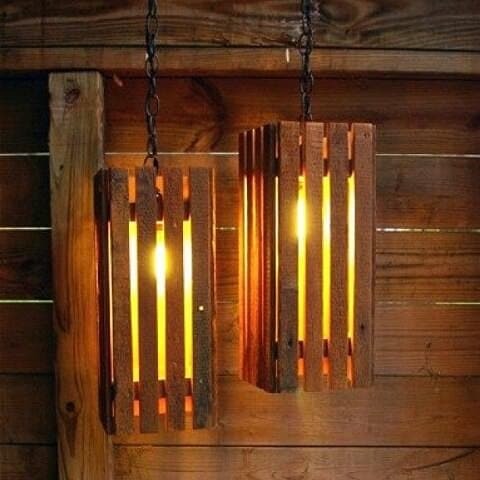 Why not get creative and recycle your wooden pallets and turn them into lanterns? You can fit a lamp inside and connect this to a power socket to create a more substantial lamp. Alternatively, you can place candles inside the lantern, to give a more ambient light. Depending on the size of your new lantern, you can place pumpkins (with candles inside) into the lanterns and then hang them from the trees or ceiling. 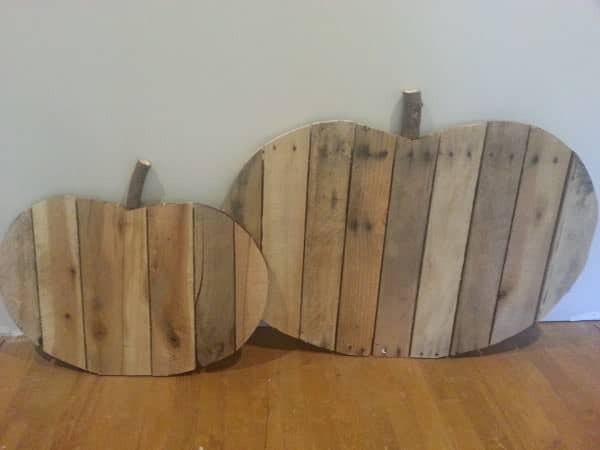 Another set of Pallet Pumpkins - Relief and Raised. As with the centerpiece, candle holders can be multi-functional. This candle holder became Halloween-ready with a simple change to dark candles. Do I want to know which way is it to PALLET TOWN? 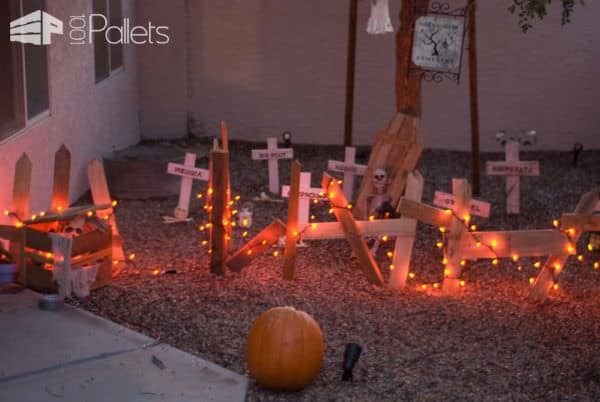 This Pallet Halloween Idea could be fun for the whole family. Have each member name a favorite town, place, or movie reference. Maybe name "streets" after each family member? The pallet possibilities are almost endless on this one. 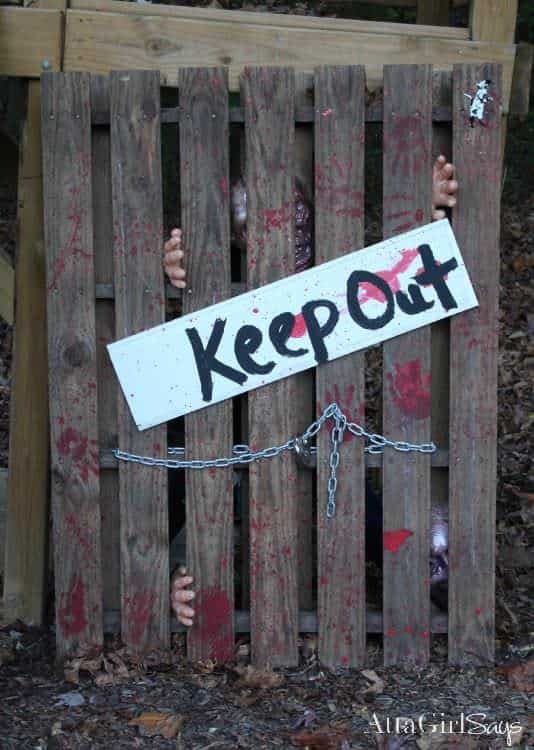 Use your wooden pallets to make scary signs pointing to different destinations. You can create one sign with multiple directions on, or alternatively, create single arrows and place them around your house and garden. 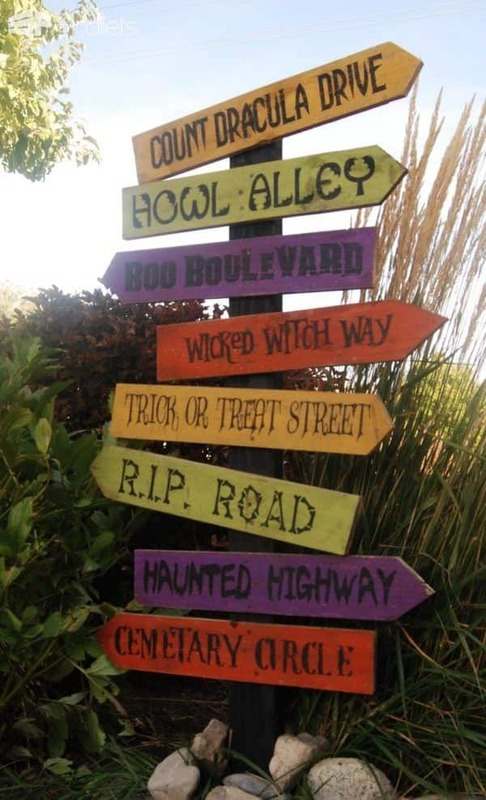 Paint the signs with outdoor paint in creepy colors and use a black marker to write the destination. Various Halloween decorations by Kerry MC. Arrrrrgh! RUN! 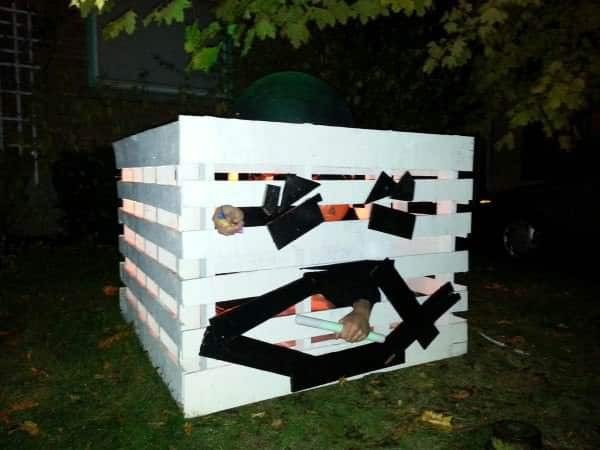 There's a monster in this deceiving Pallet Pumpkin Box! Or is there...? This candy holder would be fantastic at your Halloween party. It may empty out quick on your front porch, though. 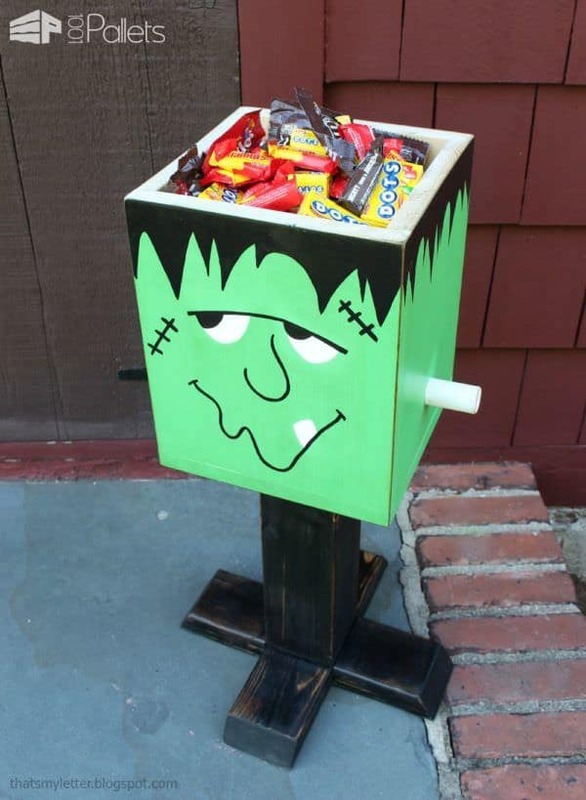 Frankencandy treats holder - could be made from pallets too! Candle holders can enjoy some spooky ambiance. Just use those LED flickering lights, and create whatever face you want. Here's where those pumpkin carving sites may be of inspiration to you. 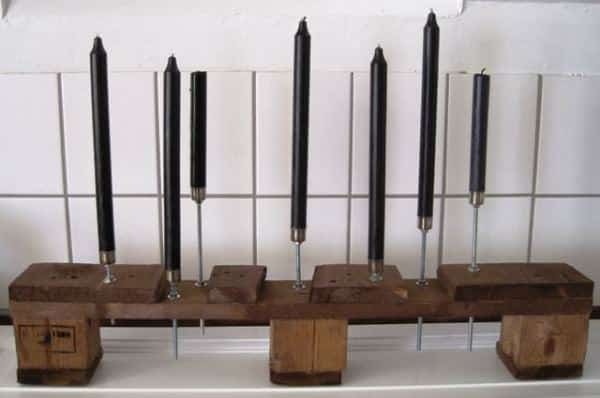 LED candle holders - could be made from scrap or damaged pallets! 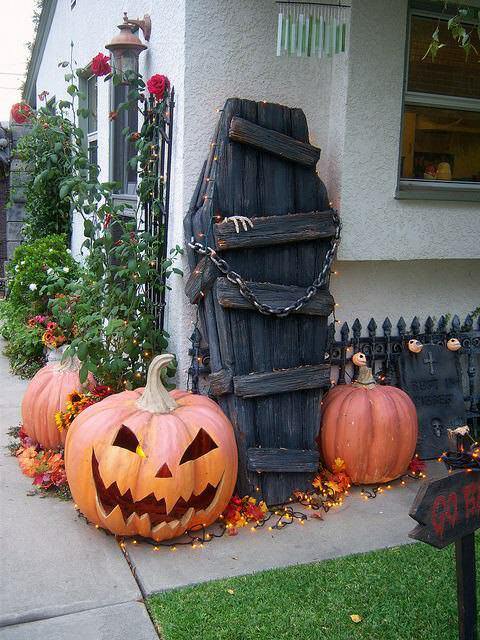 Pallet Halloween Ideas like these can be spooky or cheery. 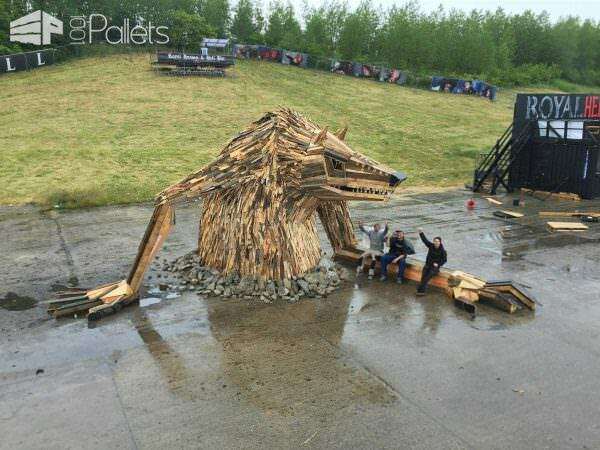 Some of these are outrageously over-the-top, but if you're part of a large, creative group, and you're doing something like a festival, or another large event, something like these pallet creatures may be a fun thing to do! 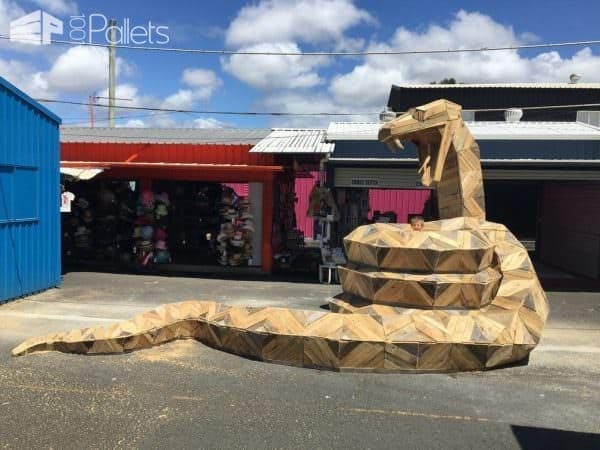 Pallet Halloween Ideas like this snake are outrageous, but who says you have to do one to this large of a scale? Make one more appropriate for your home! Sometimes, creation is so good; it can apply to almost every holiday. 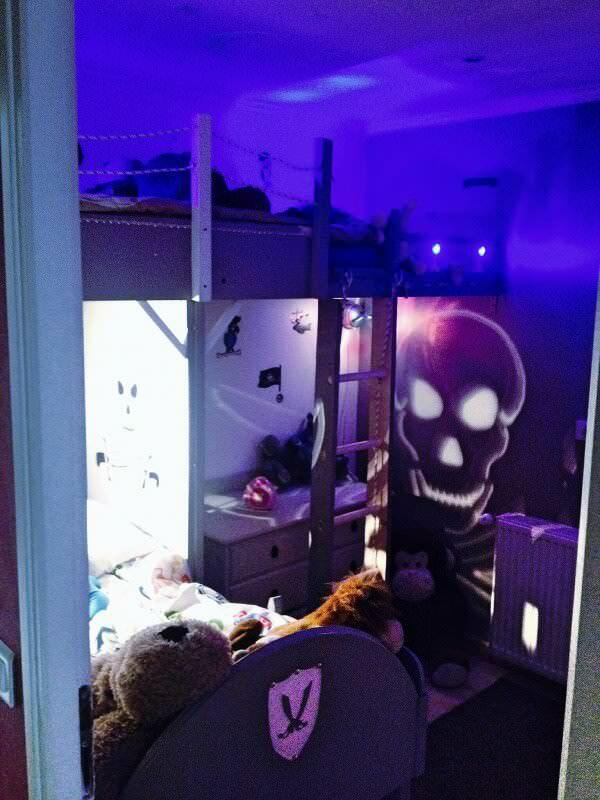 This pirate-themed kid's room, with the proper lighting, could work year-round, but with the skull cutout that creates amazing illuminated patterns on the wall, it's especially magical at Halloween. Yeah, I've been "coffin" all day. Must be the fall weather. 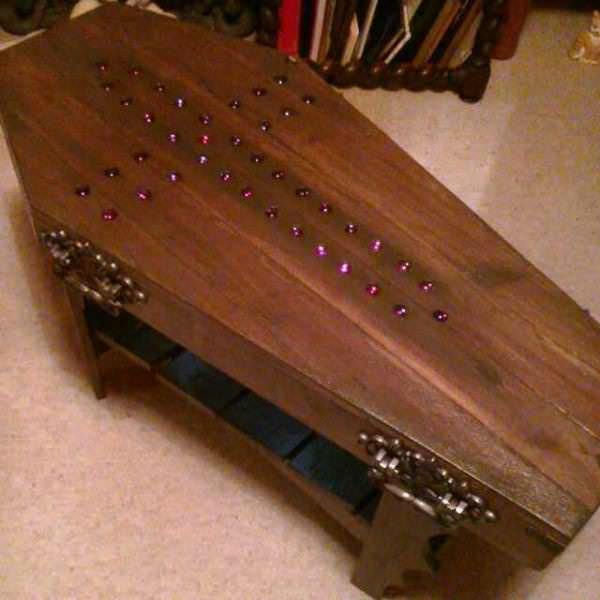 This stellar coffin-shaped table is amazing! 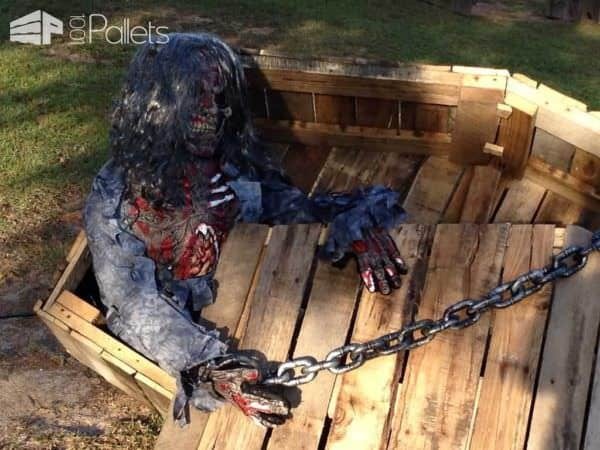 A creepy coffin made from pallets to put in front of your house! Brilliant! 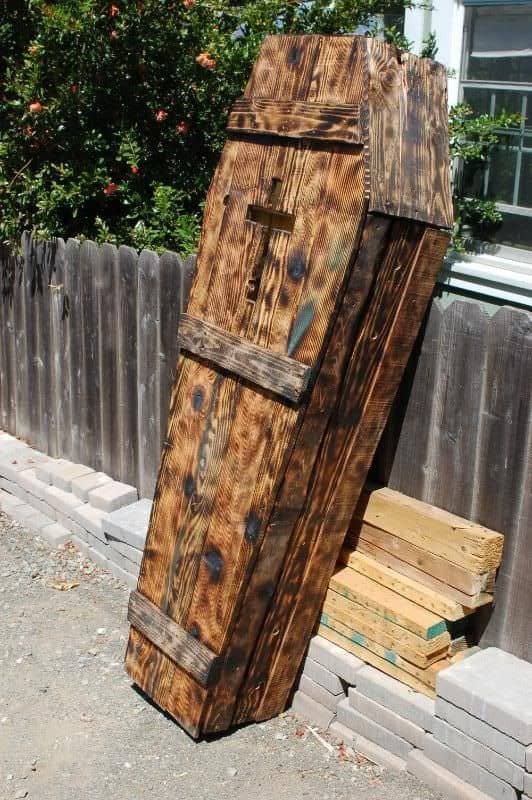 This original coffin is even scarier since it's splintered and "aged" looking! Skull chairs like this one would be amazing on a front porch, maybe with a black light behind the cutouts. Spooky AND comfy. This herringbone-patterned cat wall art may help you think of ways you can have your Halloween kitties even if your landlord won't let you. May your nightmares come true. 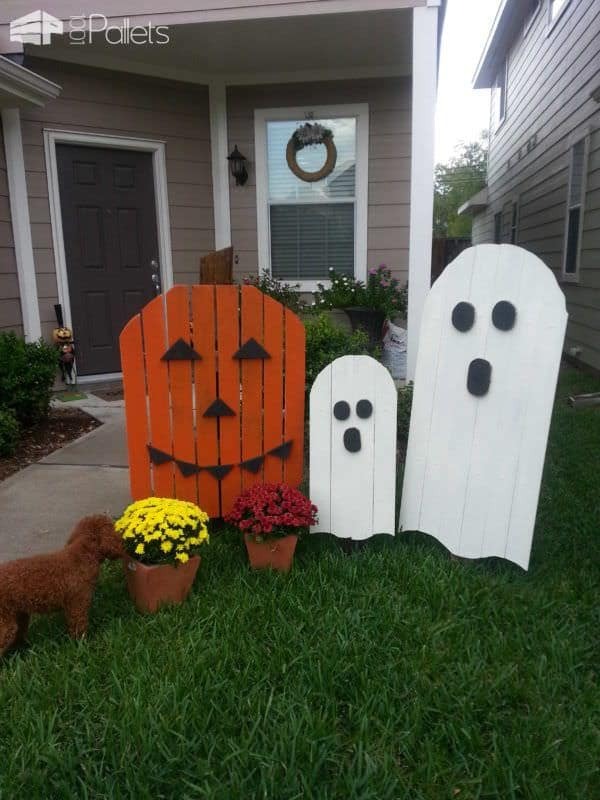 Yes, Pallet Halloween Ideas like these cutouts would work great for cutouts. Clean up the edges and glue them together, then cut whatever design out you want! Lucille. If you're a fan, you'll understand. 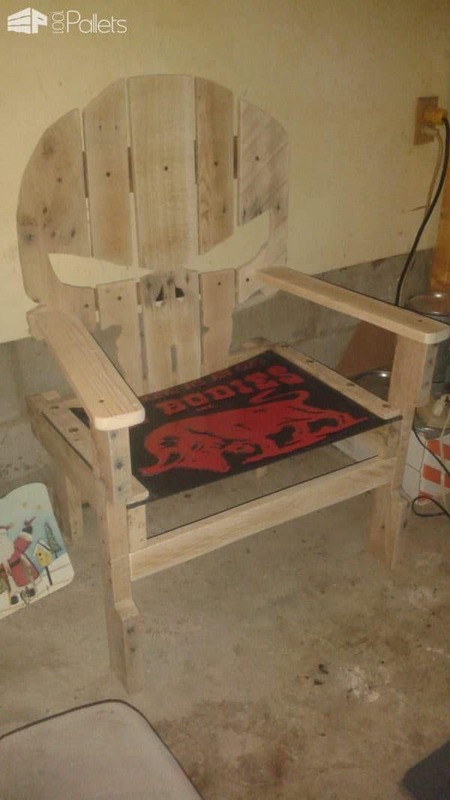 This pallet craft is made using a 4x4" maple pallet stringer that was wood-turned into a bat. The shelves are maple and poplar, featuring live-edge work, wood-burning, and several layers of stain and polyurethane. 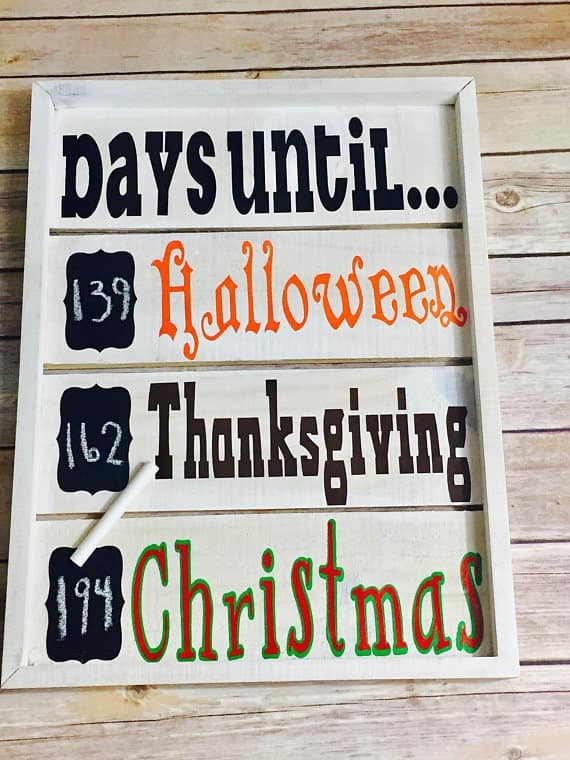 This holiday countdown sign will give your home months of style in one project! 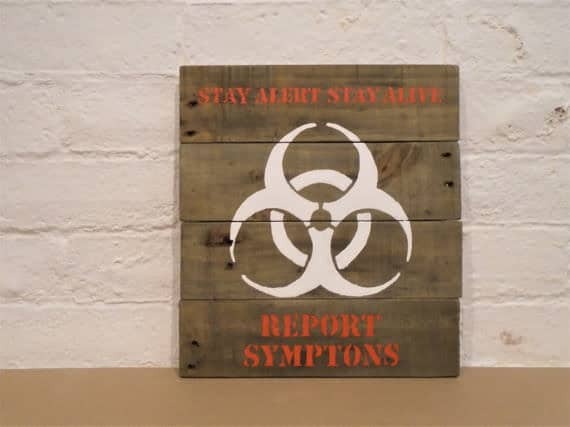 This pallet sign is a three-for-one project. You won't have to take it down until 2018! You'll want this trio of Black Cats to cross your path! The only black cats you can safely put outside on Halloween. Guaranteed to create smiles wherever you display them. PURR-fectly Feline...er...divine! 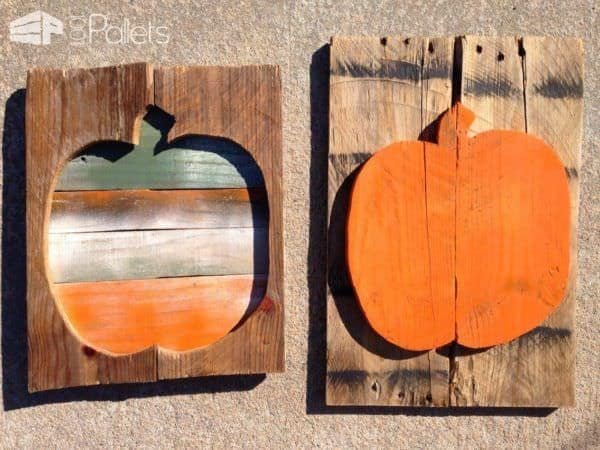 These adorable little Pallet Pumpkins can also work for back-to-back holidays! Another two-for-one project. This trio of sweet little pumpkins with curlicue flowers are perfect throughout the fall! A charming piece of wall art like this Smiling Peter Pumpkin will delight the family. 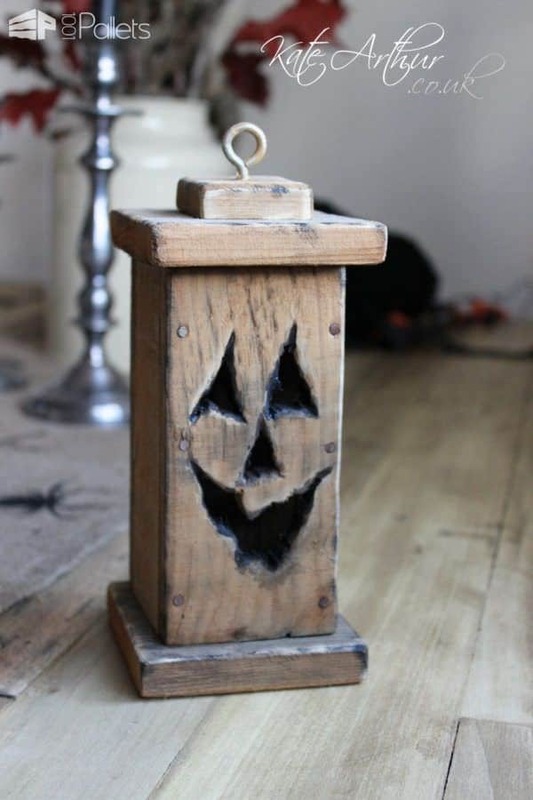 This scrap wood pumpkin is too cute for just one holiday. A Pallet wood Halloween Pallet Craft is the perfect backdrop for this Spooky String Art Sculpture. String art projects are terrific ideas to have the kids help create. Show them the basics and turn them free! 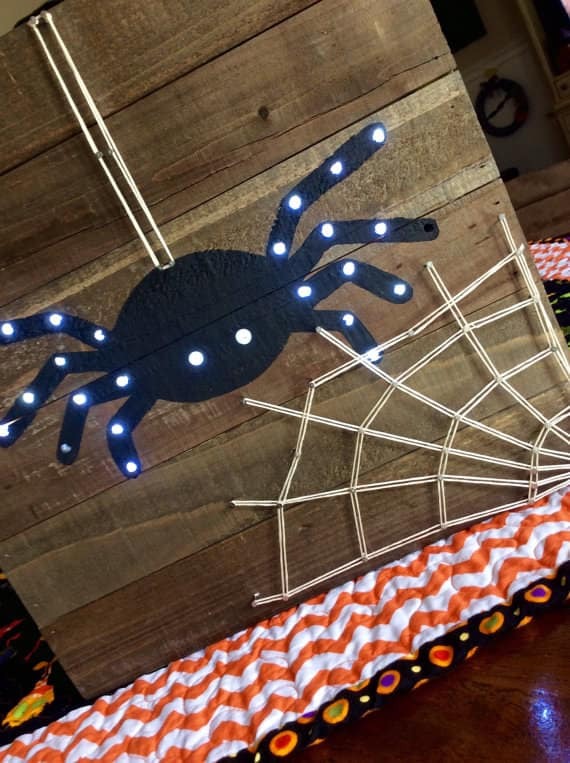 This Pallet Wood LED-Lit Spider is too cute! The only spider that isn't scary is this precious little LED-lit string-art spider. Go batty for this little Pallet Bat Sculpture! 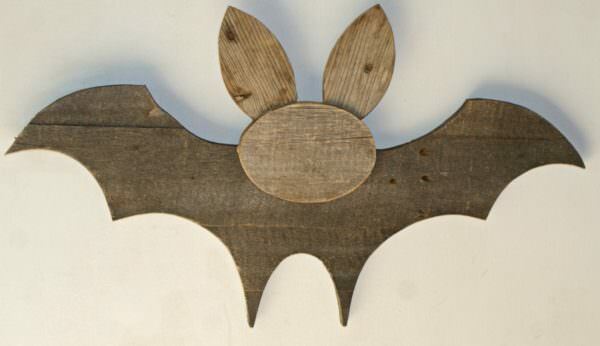 Leave this small wooden bat raw for a rustic look or have the kids paint it any way they wanted. Stay alert and stay alive, people. Always good advice. And wash your hands, people. To see a frightening Halloween Pallet Craft, make this Small Pallet Coffin Mirror. 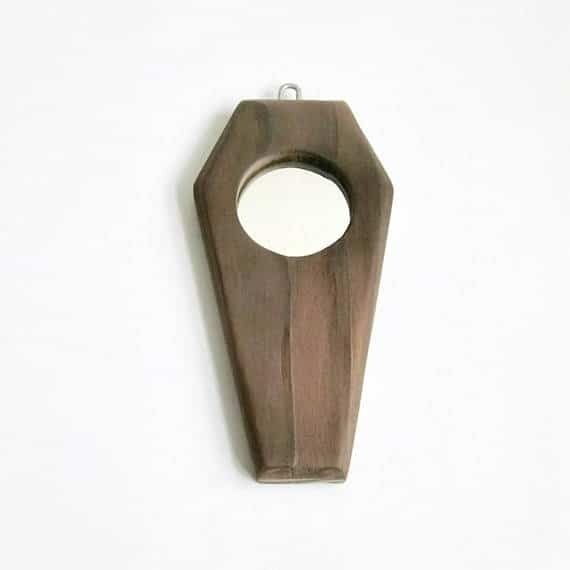 This little wooden coffin mirror is gorgeous. Make a mini-version and wear it as a pendant for Halloween. I'm here for the BOOS! 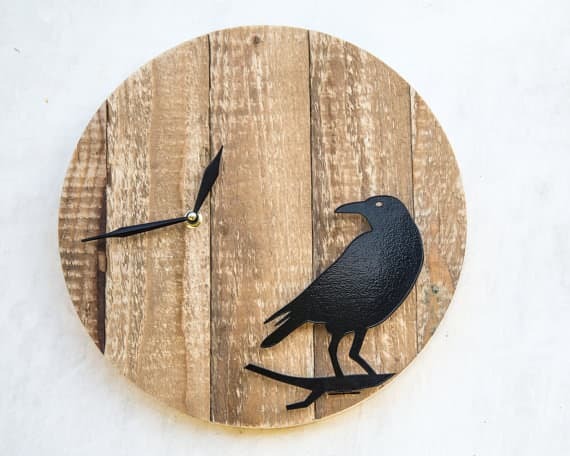 You'll "nevermore" need to ask for time with this Raven Clock! This gorgeous clock could be used year-round with its rustic elegance. 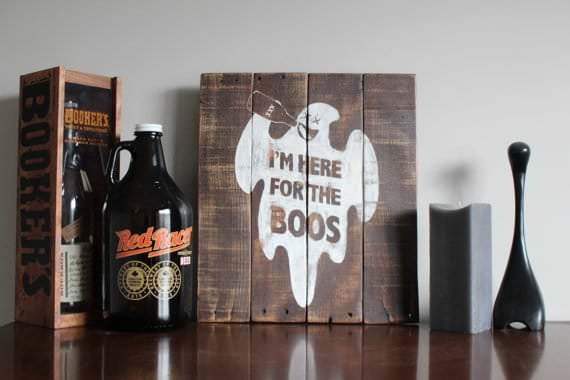 A Halloween Pallet Craft like this idea can add those finishing touches to your Halloween decor. 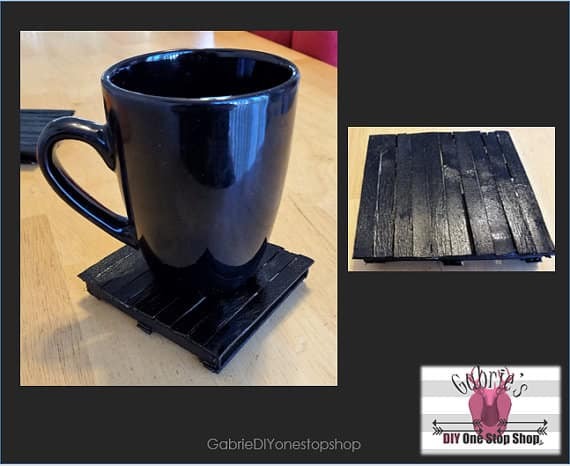 Black As The Moonless Night Pallet Mini Coasters. Black and orange mini pallet coasters will protect your furniture during those holiday parties. 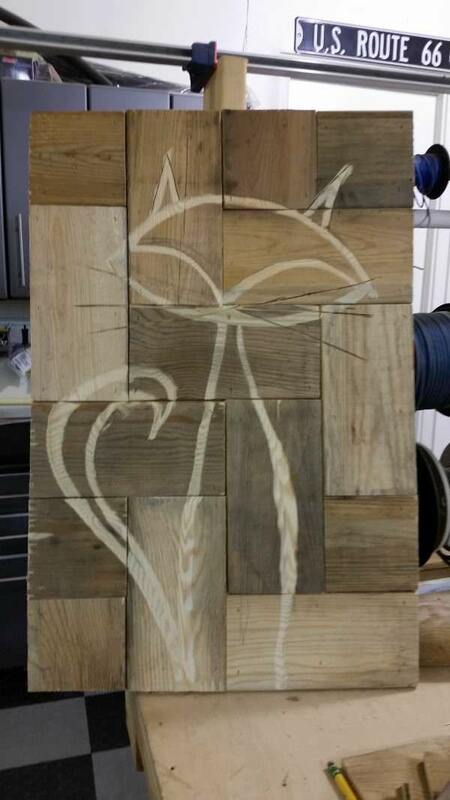 Simply Meant To Be Pallet Wall Art. Movie-inspired wall art that's sure to please. 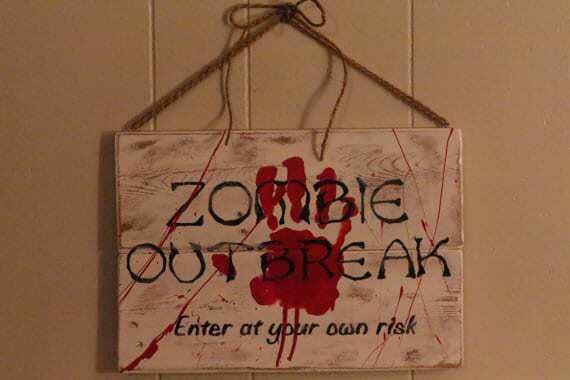 Watch out for the Zombie Outbreak! Are you Zombie Apocalypse ready? 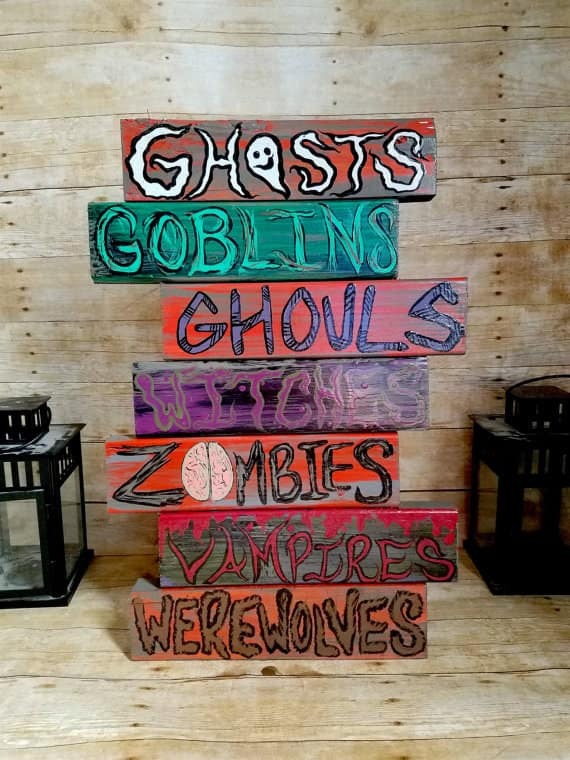 All Monster Genres Pallet Sign. If a monster type was missing, just add to it! 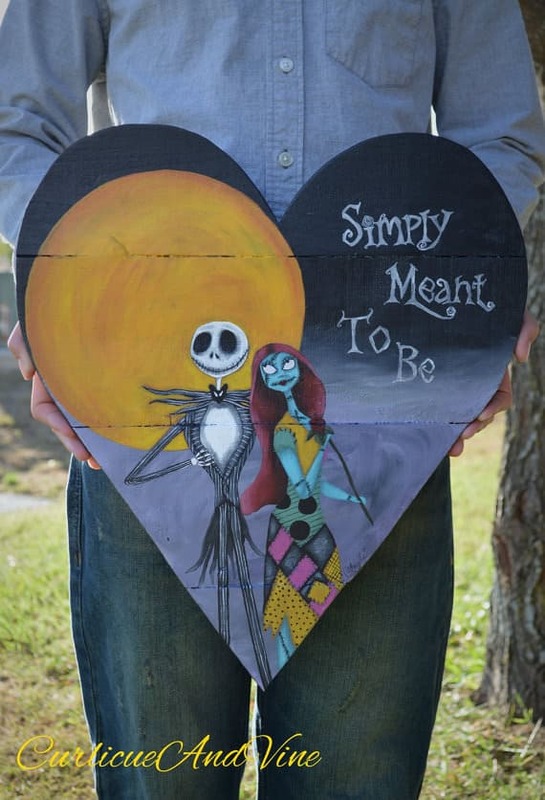 This Halloween Pallet Craft has all the bases covered. 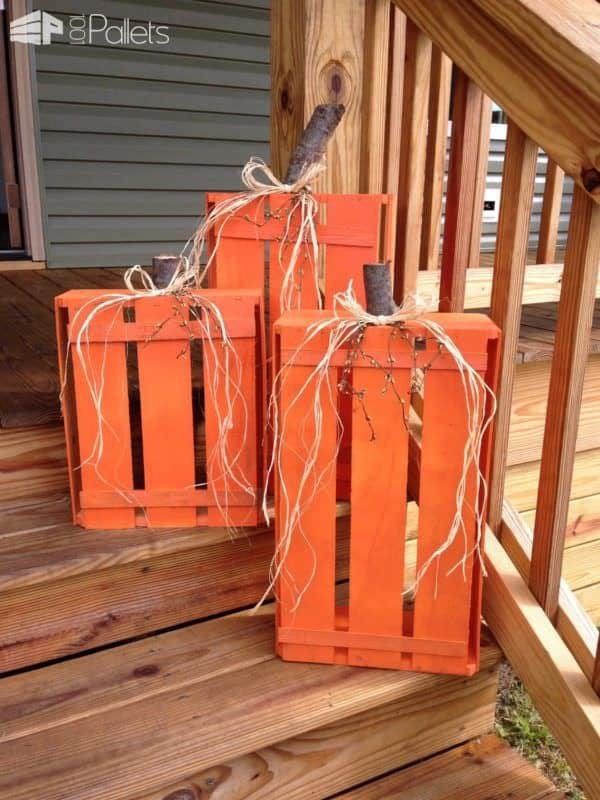 Why not recycle your wooden crates by having a Halloween bonfire? Alternatively, store your crates until bonfire night to create a spectacular bonfire. Invite all of your family and friends to the bonfire, to enjoy the heat and toast marshmallows. 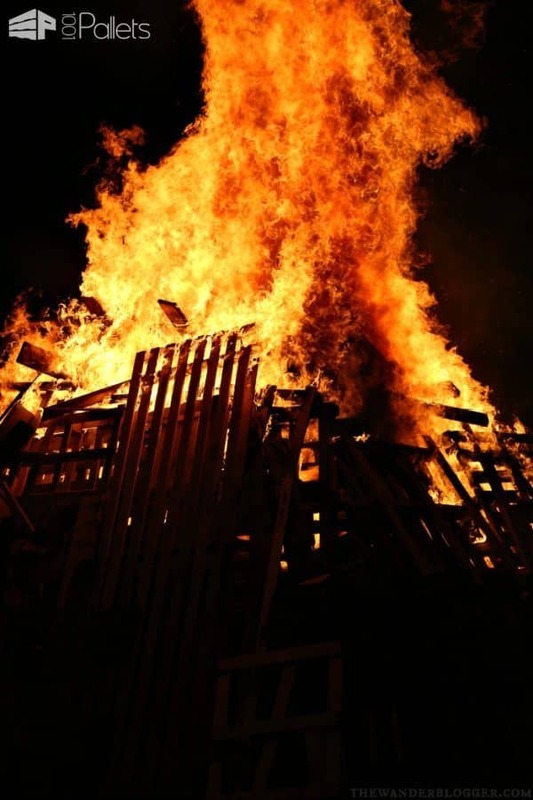 Be careful when it comes to standing by the bonfire - placing barriers around the pit will prevent any accidents. 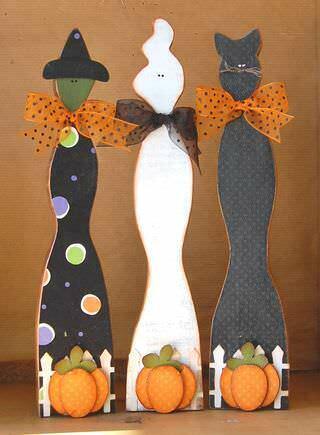 That's all for now for this best-of of Halloween pallet decorations & ideas compiled just for you! 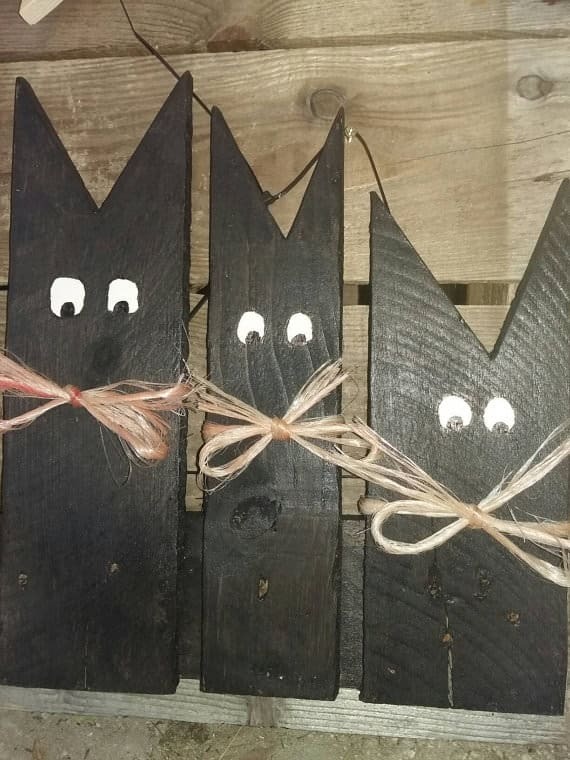 Have you made some Halloween decorations from recycled pallet wood? Share it with us!